With all the back-to-school shopping to be done, it makes sense that September is National Coupon Month. Families are hunting for great deals on pens and pencils and college freshmen are decorating their dorms, so it’s the perfect time for business to offer deals to entice bargain hunters. According to Daily Finance, 89 percent of consumers clip coupons for groceries, household and healthcare items. This money-saving habit has been around since 1909, when the first ever coupon was issued for a penny off Grape Nuts cereal. Hats off to C.W. Post for spearheading this great tradition. Since then, couponing has become a nation-wide phenomenon. They’re available in every Sunday paper, in special mailings, online and on smartphones. 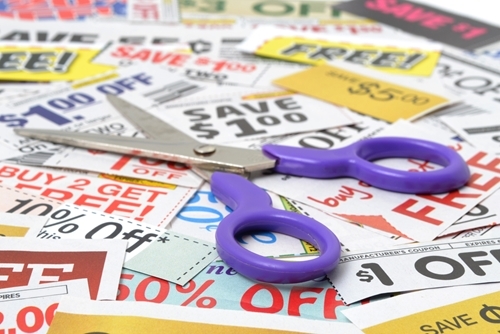 According to the Promotion Marketing Association, shoppers save more than $2 billion each year by using coupons. Television shows like “Extreme Couponing” showcase how much money diehards save, but just about everyone loves a good deal. Whether it’s a coupon for 5 percent off or getting a free promotional item with a purchase, customers will be sure to capitalize on special offers. National Coupon Month is the perfect time to get in on the coupon action. Even if your business doesn’t have a big marketing budget, you can still make the most of local papers and fliers to distribute your coupons. Getting your company’s name out there will definitely increase your foot traffic and coupons inspire people to make purchases. What should you offer? Just about anything you want! You can go the traditional route and give a discount like 10 percent off a purchase over $25. Another option is to provide a free gift with a purchase. Enviro Shopper Tote Bags are the perfect items to give away at grocery stores. Retailers can also give away functional prizes like Triple Function Lighted E-Pens or 3-in-1 Regatta Note Pads. The possibilities for personalized gifts are endless! Once you develop your hot deal, share the coupons on social media, in local papers and on community bulletin boards. Bargain hunters in your area will love the special offers and hopefully become regular customers. If you’re giving away tote bags or other visible promotional products, you’ll get twice as much for your marketing dollars with walking advertisements.